Plan Your TripGuides & ToursTour CompaniesGrant’s Getaways: Up, Up, and Away! In early morning, when the light is soft and the air is still, there’s a sense of peace in the world. But as dawn approaches at the Sportsmen’s Airpark near Newberg, Ore. that serene silence is all too quickly broken. For this is where Roger Anderson gathers folks who travel from all over the world to let their hearts soar on one of his unique adventures. 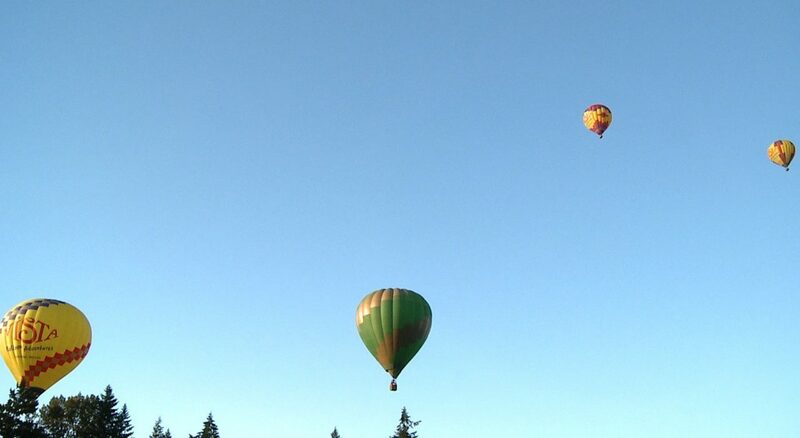 Anderson’s Vista Balloon Adventures has been based in Newberg the past ten years. 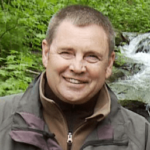 Anderson and his wife, Catherine Anderson, specialize in giving people a bird’s eye view to a corner of the greater Willamette Valley that stretches across Yamhill County. The balloons are huge – big as houses. Each balloon requires five or six “crew” (volunteers who lend a hand) to assist with each morning’s launch. First, powerful fans blow cold air (the process is actually called a “cold-air inflate”) into the nearly 200,000 cubic feet of nylon fabric. Once the balloon has been filled to its limit, ignition occurs as powerful propane gas burners light up and heat up the air inside the balloon. It’s what gives the craft its lift. It’s really a rather simple premise based upon the fact that hot air rises, but it gives passengers who ride aboard a different point of view to the landscape. Our balloon was guided by Roger Anderson, a veteran pilot with more than two decades experience in lighter than air flight. Within moments of our easy lift off, we are two, four, then six hundred feet up in the air and the other “giants” soon appear as tiny, thimble-sized floats on the ground below. As we soared across the valley, sometimes mere feet above the ground, Roger pointed out something that I might never have noticed if my feet were firmly planted on the soil below. That wasn’t all – it was easy to see how the valley near Newberg was ringed with hills – hills that grow grapes – in fact, wine grapes! But not on this fine July morning for the wind was building and the ground was heating up. If we waited too long, a soft landing could be – well, challenging! And so, after an hour of delightful touring, the time had come for us to come back to the ground. We touched down in a recently cut “seed-grass” field ever so softly, without even a bounce to the remarkable landing. 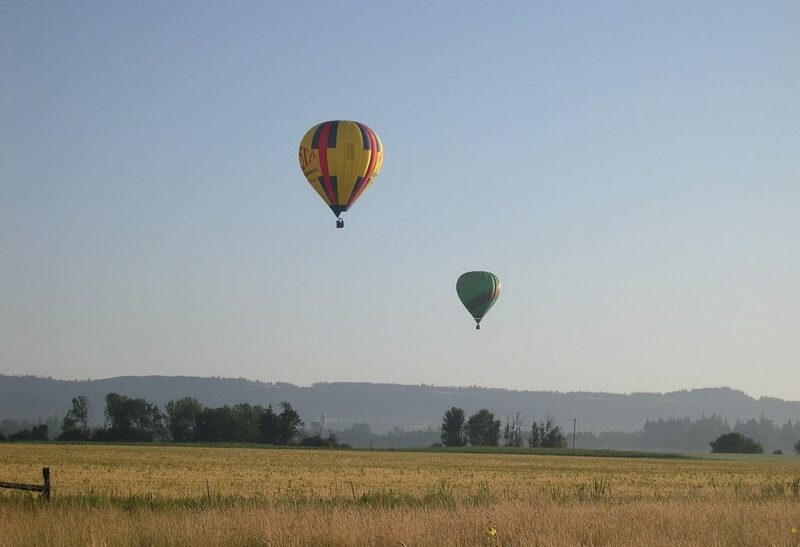 Hot air ballooning is a lovely and magical way to see a beautiful corner of Oregon and build lasting memories through a unique outdoor adventure.